“We built it mostly as an experiment and partly for the experience and to make a little money,” recalled Ben Parker, one of three men who built a DIY tiny house on wheels last year. The trio, which included Parker’s brother-in-law, Adony Alvarez, and a friend, Andy Rogers, worked on the build on evenings and weekends for eight months. At the time of the build, Parker was working as a mechanical engineer for the Navy. He has since moved to Longview, Texas, with his wife and four children where he works in the oil and gas industry. His brother-in-law, Alvarez, is a civil engineer. 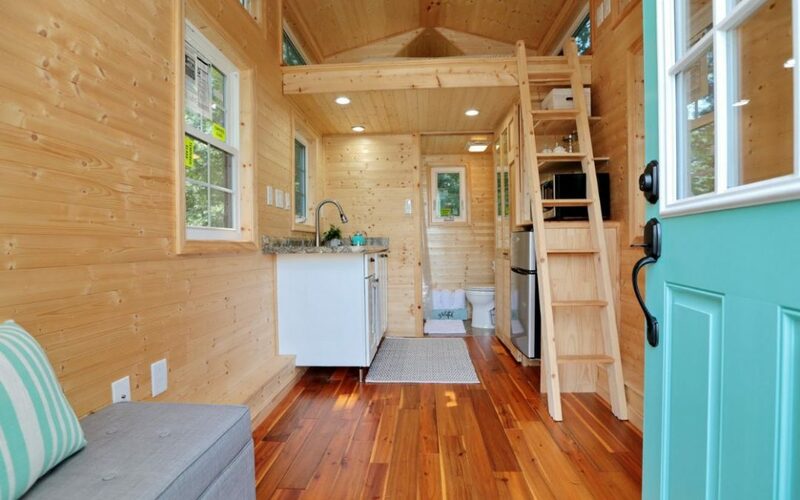 Rogers will bring their THOW to the Mid-Atlantic Tiny House Expo Maryland, on Oct 6-7, where they hope to sell it. “Andy plans to tow it to the show with his skoolie,” said Parker. It is listed for $47,000. The sellers can arrange for shipping to anywhere in the continental U.S. 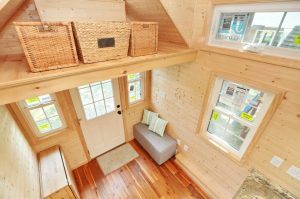 The house has a sleeping loft, storage loft, full bathroom with separate shower and flushable toilet, a minisplit heat pump for heat and air conditioning, a tongue-and-groove pine interior, and cedar siding on the exterior. 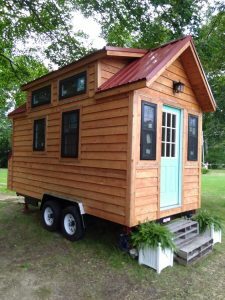 It measures 109 square feet on the main floor and 51 square feet in the sleeping loft, and weighs in just under 7,500 lbs. “We have four kids, so we would never live in one, but I could see us living in several tiny houses as a family on our own land somewhere someday,” said Parker. Parker believes tiny living will likely increase in popularity, especially as affordable housing. And he envisions individuals’ quality of life improving, and communities being strengthened, by tiny house neighborhoods.